WorkSource Seattle-King County is staffed by a team of highly skilled and dedicated professionals working to uphold the principles of universal access, integration, performance and accountability, customer choice, partnership, and continuous quality improvement across the network’s 47 locations. This past month, the Workforce Development Council of Seattle-King County and its WorkSource Operator Team had the opportunity to honor several individuals who have gone above and beyond in serving customers, pursuing best practices, and implementing Integrated Service Delivery and the Workforce Innovation & Opportunity Act in the past year. Below are the winners of the WorkSource Seattle-King County Staff Leadership Recognition Awards for Program Year 2017. Jody is “traditionally the first to volunteer” when the need arises, and models exemplary service, all while making huge contributions to improving the overall system. She is an active member of numerous WorkSource functional teams, the customer engagement team, and facilitator team. She received not one, but three nominations, exemplifying the recognition by her peers for her tremendous passion and service. The collaborative efforts of all team members were reflected in the outcome of the 2017 WorkSource Summit—a successful bridging of WorkSource voices from across the state in an informative day-long conference dedicated to the philosophy and practice of Integrated Service Delivery. The planning committee brought a diverse set of perspectives, opinions, expertise, knowledge, and skills to create and promote this event to colleagues, coworkers, counterparts, and partners across the state, ultimately ensuring its success. 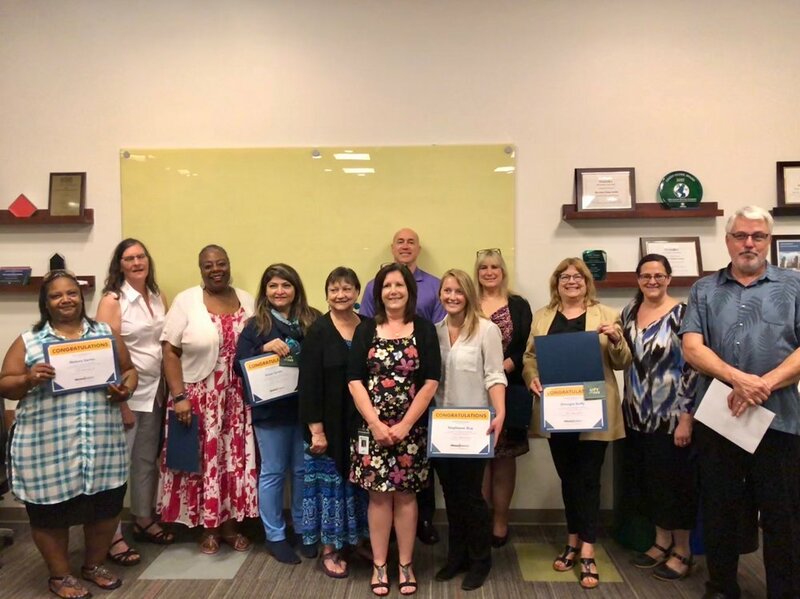 The team included Beth Blanchard, Craig Bruckshen, Nature Carter, Mary Dolliver, Georgia Duffy, Catherine Fisher, Deitra Garrett, John Glynn, Stephanie Guy, Brianna Kiarie, Saiqa Syeda, and members of the WorkSource Operator Team. Amanda’s core strengths include serving those with barriers and approaching all of her work through an equity lens. 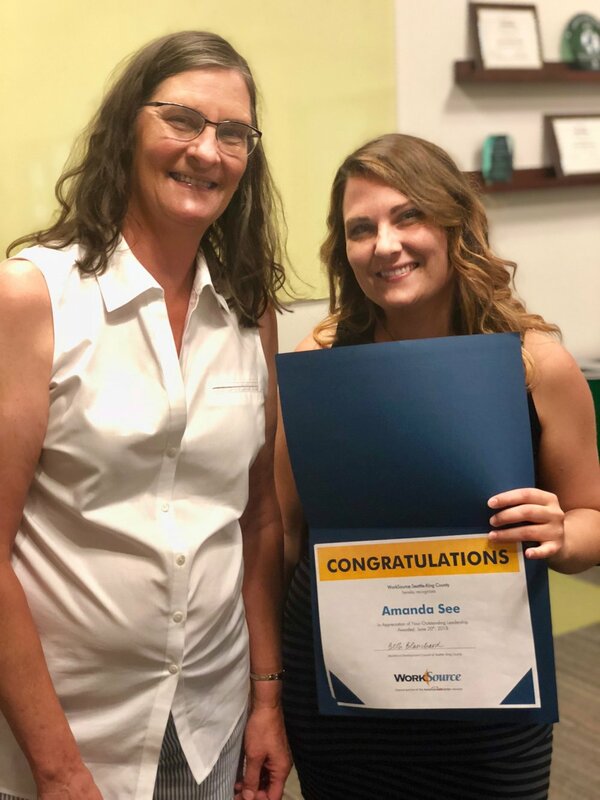 According to her nominator, she “understands that collaboration is about cross-communication, triaging services, and bouncing ideas off of others to ensure that every customer is provided with all available options. She encourages her staff and others to reach out to groups and organizations that are not being served through the WorkSource system.” Amanda’s dedication to collaboration has resulted in a successful partnership with 2nd Chance, a homeless encampment, which has resulted in specialized trainings, employment, and resource sharing across service providers. A core member of the front-line staff, Julie’s passion, energy, and commitment to serving youth and young adults led to two nominations for the leadership award. As expressed by her nominators, Julie “is an excellent communicator. She double, triple checks if she can support you and how she can best do so. … She seeks to build strong relationships and makes time to ask if there is any other way she can support or improve.” Julie receives an honorable mention for her exemplary leadership by example. Congratulations to all of our award winners and nominees! WorkSource Seattle-King County connects businesses to job seekers, as a proud partner of the American Job Center Network under Washington state’s WorkSource brand. The Workforce Development Council of Seattle-King County leads a network of 46 locations in providing job search/recruitment assistance, career planning and training, and hiring events at no cost to job seekers and businesses in Seattle-King County.